NEW ORLEANS – The U.S. Track and Field and Cross Country Coaches Association (USTFCCCA) announced Thursday that the University of Nebraska and the University of South Carolina were selected as the 2009 Indoor Track and Field and Outdoor Track and Field Scholar Teams of the Year, respectively. The Cornhuskers maintain a team cumulative GPA of 3.074. Seven other programs with a top-25 finish at indoor nationals earned All-Academic Team honors for their academic and athletic achievements this season. 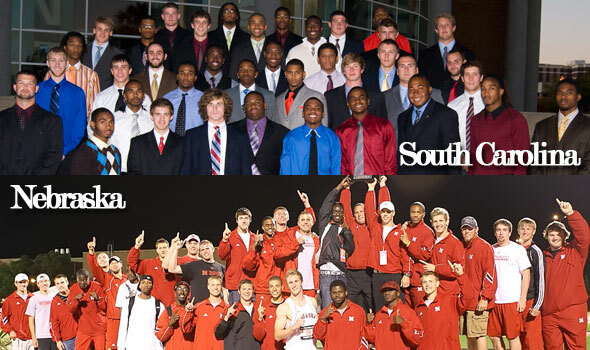 South Carolina, the 2009 Division I Men’s Outdoor Track and Field Scholar Team of the Year, earned the Outdoor Scholar Team of the Year distinction by virtue of a sixth-place finish at the outdoor national championships and maintaining a team cumulative GPA of 3.090. The sixth-place finish for the Gamecocks was the program’s best effort at the outdoor national championships. Prior to the national meet, South Carolina finished second overall at the East Regional Outdoor Championships and fourth overall at the SEC Outdoor Championships. Joining South Carolina on the All-Academic Teams list are seven other schools that finished in the top-25 at the outdoor championships. In addition to the Indoor and Outdoor Scholar Teams of the Year, the USTFCCCA also announced the men’s 2009 Division I All-Academic Track and Field Teams. A total of 68 Division I programs were recognized as men’s 2009 All-Academic Teams. DePaul University led all institutions with a 3.419 team cumulative GPA, followed by Brown University with a 3.390 team cumulative GPA, and Yale University with a 3.370 team cumulative GPA. The Ivy League led all conferences again this year with six teams selected as All-Academic Teams for 2009 – Brown, Columbia, Cornell, Dartmouth, Harvard, and Yale. The Big 12 Conference followed with five teams selected to the list. The Colonial Athletic Association and the Southern Conference each had four teams selected as All-Academic Track and Field Teams. The selection of the All-Academic Indoor and Outdoor Scholar Teams of the Year award is based on a combination of academic and athletic achievements, with the top honor going to the team that had the combination of best overall finish at the respective Division I Indoor or Outdoor National Championships and cumulative GPA. To be nominated, the team must carry a minimum 3.000 cumulative grade-point average.